Access your Account-Statements around the world. The Comptoir National d’Escompte de Paris (CNEP) specialised very early on in international trade financing, and began to establish its pioneering international banking network in 1860. It was also a key player in corporate finance and in the financial markets. The Comptoir d’Escompte de Mulhouse, founded at the initiative of textile and manufacturing entrepreneurs, was taken over by its subsidiary, the Banque Nationale de Crédit, in 1930. This firm, which foundered during the crisis of 1932, was re-launched under the name of Banque Nationale pour le Commerce et l’Industrie (BNCI). BNCI was notable for its dynamic commercial approach, its innovations and its creation of an international network based in Africa. In 1945, CNEP and BNCI were nationalised. 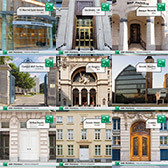 They merged in 1966 to form the first French state bank, the Banque Nationale de Paris (BNP). BNP was part of extending access to the banking system to the French population on a massive scale. In 1993, BNP was privatised under the leadership of Michel Pébereau, who profoundly transformed the company. In 1999, after an intense stock market battle, BNP took control of Paribas. Founded in 1872, Paribas (then called the Banque de Paris et des Pays-Bas) rapidly became the leading French investment bank. It held stakes in a large number of companies and specialised in the financial markets and in infrastructure finance. In 1998, Paribas took over the Compagnie Bancaire, a financial services company created in 1946 and a crucible that forged pioneering companies such as Cetelem (1953). 2009: Fortis Bank (later BNP Paribas Fortis), created in 1999 following the merger between the Generale Bank (formerly the Société Générale de Belgique, founded in 1822) and the Caisse Générale d’Epargne et de Retraite (CGER)/Algemene Spaar- en Lijfrentekas (ASLK), established in 1865.